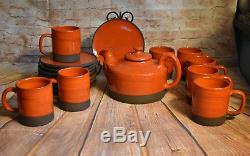 This vibrant orange and brown tea set has one teapot with lid, 8 mugs, and 8 small plates. 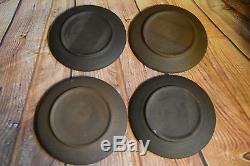 The plates could be used as saucers, though they don't have the indent for the cups. Each plate measures approximately 6 1/4 in diameter. 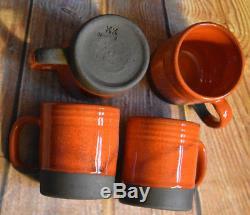 The mugs are each approximately 3 1/2" tall and 3" wide, not including the handle. They hold about 8 ounces. 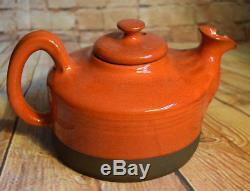 The teapot measures about 9" long from handle to spout, 6 1/4" wide, and 5 tall to the top of the handle. It holds about 5 cups when full. 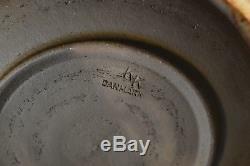 All of the pieces are marked Danmark, KK on the base. 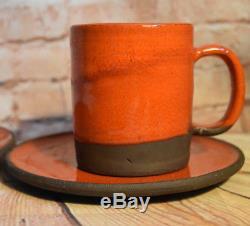 The maker is possibly Kingo Keramik, from the Danish island Fyn, though it appears little is known about this company. The pieces are all heavy and feel like stoneware. 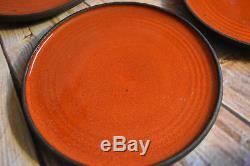 The orange crackle glaze is even more vivid than my photos reflect. The set is in very good condition over all. 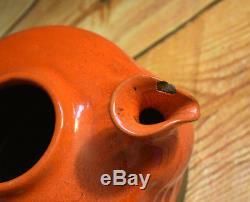 The tea pot has a chip on the rim of the spout, and a couple places where the glaze didn't cover. One of the mugs handles has been repaired. 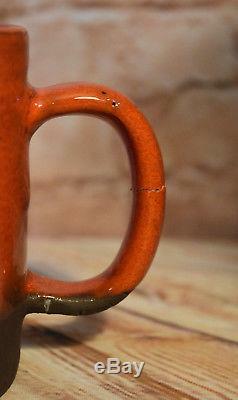 Another mug has a flake in the glaze at the rim. Otherwise there is minor surface wear. Please see my pictures and thanks for looking! I package fragile items securely and with care. 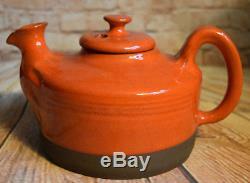 The item "Vintage Fat Lava Danish Studio Pottery Orange Tea Pot 8 Mugs & Plates Denmark KK" is in sale since Sunday, February 11, 2018. 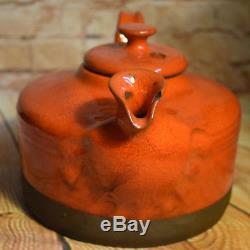 This item is in the category "Pottery & Glass\Pottery & China\Art Pottery\Scandinavian Pottery". 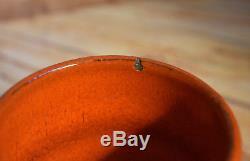 The seller is "kerrberry" and is located in Freeport, Maine. This item can be shipped worldwide.